This is a difficult review for me to write because I disagree with pretty much everything in Lee’s new book “Time Reborn,” except possibly the page numbers. To begin with there is no “Crisis in Physics” as the subtitle suggests. But then I’ve learned not to blame authors for title and subtitles. Oddly enough however, I enjoyed reading the book. Not despite, but because I had something to complain about on every page. It made me question my opinions, and though I came out holding on to them, I learned quite something on the way. 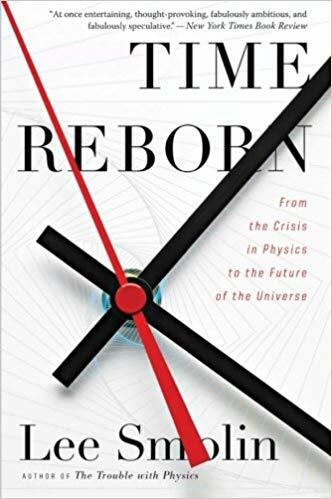 In “Time Reborn” Lee takes on the seemingly puzzling fact that mathematical truth is eternal and timeless, while the world that physicists are trying to describe with that mathematics isn’t. The role of time in contemporary physics is an interesting topic, and gives opportunity to explain our present understanding of space and time, from Newton over Special and General Relativity to modern Cosmology, Quantum Mechanics and all the way to existing approaches to Quantum Gravity. Lee argues that our present procedures must fail when we attempt to apply them to describe the whole universe. They fail because we’re presently treating the passing of time as emergent, but as emergent in a fundamentally timeless universe. Only if we abandon the conviction, held by the vast majority of physicists, that this is the correct procedure, then can we understand the fundamental nature of reality – and with it quantum gravity of course. Lee further summarizes a few recent developments that treat time as real, though the picture he presents remains incoherent, some loosely connected, maybe promising, recent ideas that you can find on the arXiv and I don’t want to promote here. I’ll leave my objections to Lee’s arguments for some other time. For now, let me just say that I explained in this earlier post that a deterministic time evolution doesn’t relieve us from making decisions, and it doesn’t prevent “genuinely novel ideas” in any sensible definition of the phrase. In summary: Lee’s book is very thought provoking and it takes the reader on a trip through the most fundamental questions about nature. The book is well written and nicely embedded in the long history of mankind’s wonderment about the passing of time and the circle of life. You will almost certainly enjoy this book if you want to know what contemporary physics has to say, and not to say, about the nature of time. You will almost certainly hate this book if you're a string theorist, but then you already knew that. At last, a sensible review... thank you. The arguments strike me as reconciliation between how time behaves in "our" world vs the existence of time in "the" world, But would need to understand more about what he is saying first. What does he mean when he says the vast majority of physicists think time is emergent? I've only seen that idea in the context of some of the non-string approaches to quantum gravity, and it certainly didn't seem to be a widespread conviction even among physicists interested in quantum gravity. ""except possibly the page numbers""
Certain distinction do need to be understood, as a position one might take regarding Time. Understanding this historical idealization in terms of making concepts manifest are further highlighted as we go over that development. :) Is it only a "mathematical truth" then? One very old and pervasive habit of thought is to imagine that the true answer to whatever question we are wondering about lies out there in some eternal domain of "timeless truths." The aim of re-search is then to "discover" the answer or solution in that already existing timeless domain. For example, physicists often speak as if the final theory of everything already exists in a vast timeless Platonic space of mathematical objects. This is thinking outside of time. See:WHAT SCIENTIFIC CONCEPT WOULD IMPROVE EVERYBODY'S COGNITIVE TOOLKIT? A "scientific concept" may come from philosophy, logic, economics, jurisprudence, or other analytic enterprises, as long as it is a rigorous conceptual tool that may be summed up succinctly (or "in a phrase") but has broad application to understanding the world. It's interesting that "emergent" has become such a popular word lately. Usually what it really means is, "I have no idea how my theory can explain this observed fact, and I fear that it probably never will, but I can postpone the evil day [when this becomes generally recognised] by talking in this nebulous way and hoping that it becomes generally accepted wisdom." Classic example: spacetime geometry "emerges" from string theory/ gravitons propagating on flat spacetime/etc etc etc. I could not understand his statement that since there is nothing outside the universe, the could be no (eternal) mathematical truths that nature can correspond to. But mathematical truths does not need to be physically lying outside the universe. It could be mental, and their existence is a consequence of logical consistency. To me an emergent time is a much more clear and concrete concept than is real time. (A good example I think is "thermal time" which is a mathematically quite profound and rigorous concept). 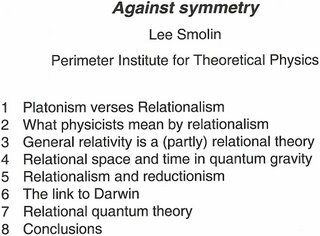 What I do not understand is what Smolin means by "real". This seems to be completely at odds with Copenhagen and I thought that the "good-bye" to objective reality is one of the big lessons we have learned from q.m. Does anybody know if Smolin's ideas are based on a modification of q.m. ? And if so, what is it ? Following perspectives here with Bee illuminate what is reflected by Bee's questions about Tegmark's solution as a mathematical underpinning, as to the question of it's truth. The same question on Time, is also to ascertain what symmetry means and how Lee classifies this too. With this you get the sense of what he means, and personally I don't find it offensive with regard to myself coming from a Platonic foundational perspective with regard to the development of the geometrical underpinnings as an "abstract feature" as a basis to reality. Using this parameter of thinking you learn to understand where you belong with regard to Lee's perspective. Ranque-Hilsch vortex tubes spontaneously separate hot from cold gas molecules, -40 C and 120 C outputs from ambient temperature air. Theory played catchup to observation (subtle footnote therein), then South Africa’s Helikon process for a half-tonne of 93% HEU. Time remains an uncrackable nut, along with parity violations, SUSY, and quantum gravitation – all assuming exact vacuum mirror-symmetry toward fermionic matter. A geometric test (jpeg) of spacetime geometry uses self-similar, extreme opposite chirality fermionic matter distributions. Empirical failure of rigorous maths is economics not science. Science tests founding postulates. "You will almost certainly hate this book if you're a string theorist, but then you already knew that." Sabine could you explain what do you mean by that? BTW I'm in Germany again. Have you ever been to Aachen? If yes did you like the city:-)? Are there ways to test Smolin's ideas, such as the main one that basic laws change with time. Is this discussed in the book? Yes, "emergent" and also "complex" have become very fashionable words, and they are frequently used quite sloppily without much content. However, physicists normally use the word with a quite clear meaning. It is commonly used to describe properties of a system that do not make sense, or do not even exist, at the fundamental level (degrees of freedom) but only on larger scales. Time, in particular, as a coordinate may be "emergent" if space-time is fundamentally discrete and geometry only exist as an approximation. The metric, curvature, and so on, may be approximate (emergent) descriptions of more fundamental degrees of freedom which we don't yet know. Etc. It just indicates, that the math cannot be the complete/exact description of reality. Regarding the atemporal universe, the space concept is closely related to time and these two quantities cannot be separated from it. IMO it's impossible to create/describe the universe without time concept. In AWT the time and space are equally real concepts. It's just "politically correct" replacement for aether model, in which every object is composed from many others in emergent way, i.e. like density fluctuations of gas. Or at least I don't know about any better physically relevant example of emergence. If Smolin's ideas led to a first-rate prediction that would offer a definitive test of his ideas, I think the response would have readily identified that prediction. I strongly suspect that Smolin's predictions regarding his cosmological musings are of the plastic variety that have become so popular over the last 40 years. Sort of like: 'One prediction can shape-shift to fit any observational result'. Feel free to correct me with something more substantive. No, it is not part of the physical universe. But what I was saying is that even if there is a Platonic realm of abstract mathematical entities, since it is not physical we cannot say it lies outside of our physical universe. "Outside" is a relationship between two physical systems. But Smolin seems to be using this point to argue for the non-existence of (a Platonic world of) eternal mathematical truths. P.S. I am not defending Platonism, I am just questioning a possible categorical mistake in his argument. Are you really telling me you are not able to a) look at Lee's Wikipedia page and find the one book among a total of four that explains his idea in great detail and b) Do a search for "cosmological natural selection" on the arxiv, which would have lead you straight to this paper? Why are you wasting my time with your refusal to even look at the literature before you're handing out ill-founded "criticism", even after I told you where to look? "Sie sind auch ein großer Mathematiker. Existieren algebraische und geometrische Systeme für Sie absolut und an sich, oder halten Sie diese für nützliche Instrumente und Erfindungen?" meine Aussage aber interpretieren, wie Sie mögen." Without wishing to upset you further, let me just explain my general policy regarding new ideas. I ask the author to: First - "Show Me The Predictions!" When I see them I have a better feeling for whether or not to invest time in studying the new idea. With so much crackpottery and pseudo-science coming at us from professionals and amateurs alike, my strategy is highly rational and scientific. Last two threads at Peter Woit's NOT EVEN WRONG are required reading. Game on! TyTung: P.S. I am not defending Platonism, I am just questioning a possible categorical mistake in his argument. I have been dealing from this perspective as well, so what you offer Bee as explanation to tytung still to me has to be considered. Any measure then, serves to activate a counting to begin? So you choose to be discrete. Some how you cannot distance yourself from any operation as to say the location is other then a configuration space, and that you are operating within it? I have the book on Kindle, though I have not gotten far into it. I'm finding the reviews very interesting, though! Allow me to speculate that what Lee means by real is what Einstein meant by "physically real:" " ... independent in its properties, having a physical effect but not itself influenced by physical conditions." In general relativity, time (in the context of divisions among past, present and future) is an illusion because neither time nor space are physically real; only spacetime is physically real. By allowing time some extra measure of physical reality independent of spacetime, we look for ways to extend Einstein, as Einstein extended Newton. I like to believe that Lee is still a relativist. "Formerly it was believed that if all things vanish from this world, space and time would remain, but according to the theory of relativity, space and time vanish together with all things." Your last quote would fall into a certain category with respect to Lee Smolin's book, and with respect to what vanishes. If correct, then String Theory which has relativity emerge from it's theoretical domain, and because that theory is abstract, it would end with Einstein's statement. No further progress. I would need somebody who is well versed in string theory to respond to that accusation. I could be wrong in my assessment of Lee's position. If space and time, or space-time, are/is relational, then if matter is removed there is nothing to relate to. Without objects the concept distance has no reality. Just to have know that I just finished reading the book, with my initial realization is in now knowing that it’s certainly not finished with me. It is certainly true that both space and time (or space-time) are determined, not by external and eternal space and time coordinates, but by matter and the various material relationships existing in the universe. This was a powerful insight of relativity theory, and also, incidentally, the basis for the pictorial "research" of artists such as Cezanne, Picasso, Braque and Mondrian, for whom perspective space played a similarly superfluous role. Nevertheless, Einstein was wrong, because without space and/or time we have no way of determining either the presence OR the absence of matter. For matter to be absent from the universe, there needs to be some space from which it is absent and there needs to be some length of time for it to be absent. This is implied in the notion itself and cannot be separated from it. Absence of matter without some time for the matter to be absent is clearly meaningless. A similar error arises when people assume that time is equivalent to change. But how could change be perceived if not against an unchanging time during which the change takes place? Einstein was wrong here in more or less the same sense that he was wrong about the aporia so intrinsic to quantum theory. The bottom line is that when we arrive at certain boundary conditions, certain unresolvable paradoxes (aka aporia) arise, which Einstein and many others are simply not capable of accepting. In my view they must be regarded as axiomatic. "Even as I mentally argued with this book, I kept on ploughing through to see how Smolin dealt with the objections... And that is how this book should be read: as an account that makes you ask questions." Definitely looking for the right answers and any help is much appreciated. Thanks. I did come across this, "How does classical GR concept of space-time emerge from string theory? So definitely, what I leave off as a question mark for me, becomes a point with which I have to go back over. I know you science people are busy. Excuse me, where is the mainstream? First Issue of the New Nordita Newsletter!